1st- You can have pants just like these (if selected pockets vary) or, Select your Image theme or Give us 2-3 themes for the art on your pants. Don't worry, whatever you mention we will use as inspiration to create some amazing art for your pants. Previous customer theme examples include, "Bob Marley", "Country Music", "Kanji", "Wolves", "Buddha", "Vintage Tattoos". Anything is game! Just mention right in the notes section during checkout. 2nd- Sit back and wait 7-14 days for your one of a kind yoga pants to arrive, slip them on, snap a picture, send it to us and get 30% off your next order at COUTURETEE.COM. Just in case you are unsure of our supreme, practically divine skill to create incredible yoga pants, click on the Image Gallery Link above or navigate to our Portfolio page to check out our works. Limited run one of a kind yoga bottoms made of an organic cotton/cotton/spandex blend embellished with original art pieces. 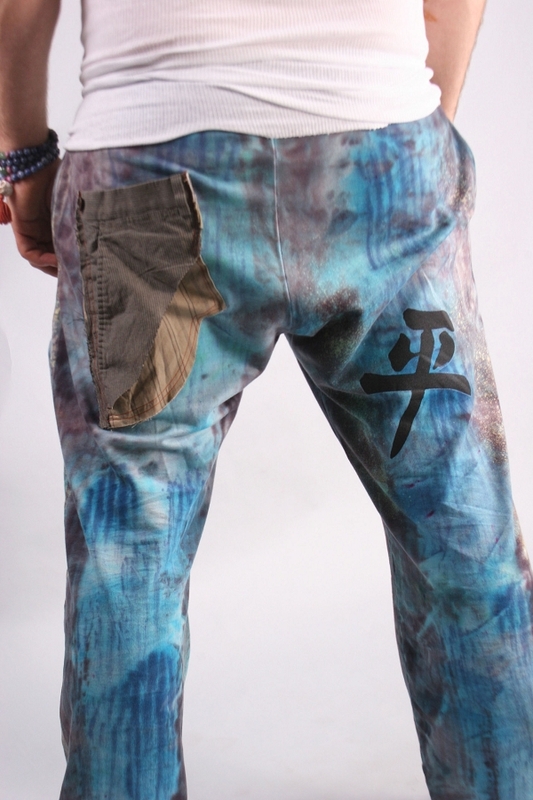 Pockets vary and made from re-purposed high end men's pants. Note: Every yoga bottom is made to order by an artist. Colors may vary slightly Artistic inconsistencies make every reproduction unique and yours. No one else will have pants quite like yours.